We were called out by a San Diego property manager to repair a pool heater on behalf of a 4S Ranch rental property. The renters were having a party the coming weekend and were wanting to use the hot tub. 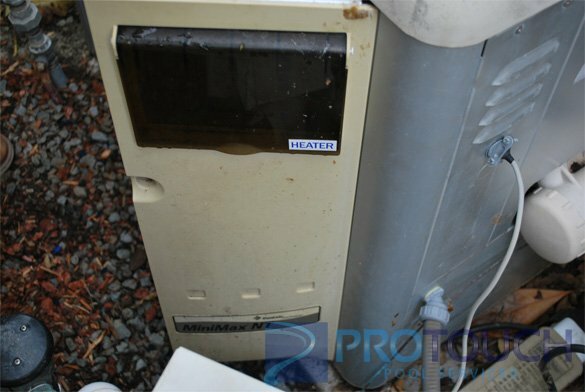 When they tried to heat the spa it was noticed that the heater was not working. 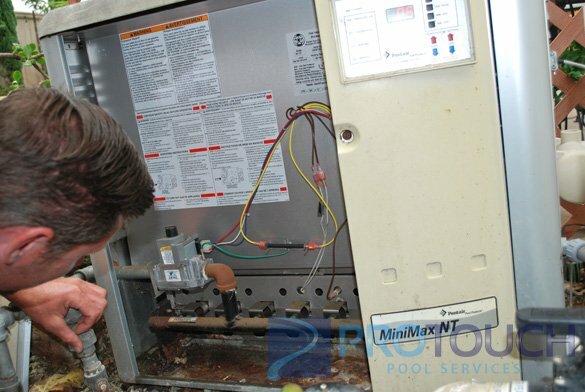 The current swimming pool service company maintaining the pool and spa did not perform heater repairs. 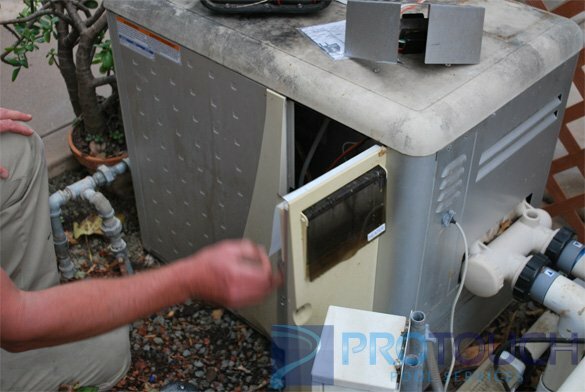 Therefore a swimming pool heater repair was scheduled for the following day. We were informed that the pool and spa heater was a MiniMax NT swimming pool heater. Since that pool heater is obsolete and an older we gave them the option to install a new pool heater rather than repair the older heater. They asked us to try and repair the current pool heater. Our goal was to complete the pool heater repair as soon as possible so the spa could be used at the weekend pool party. 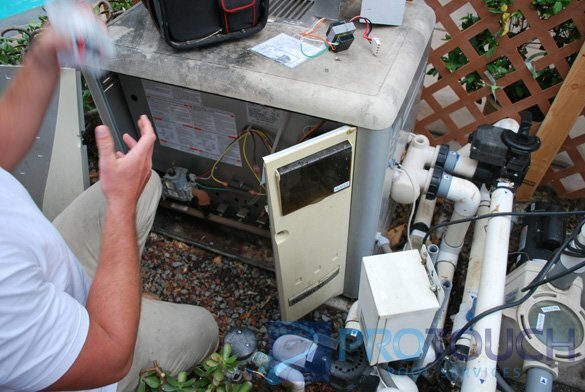 When we arrived at the San Diego 4S Ranch swimming pool we began the pool heater repair by first turning on the heater. The digital display on the Pentair MiniMax NT pool heater was not lighting up when we tried to turn up the thermostat. 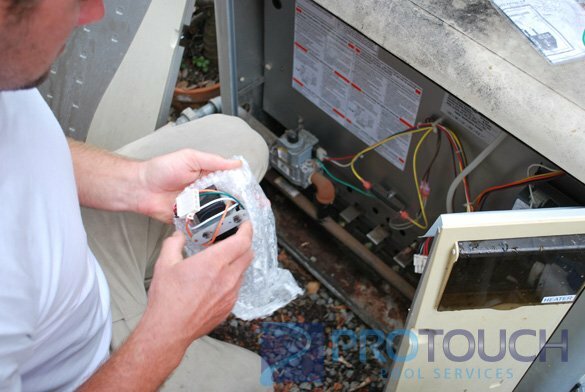 Our swimming pool repair technician opened the front of the pool heater to access the electrical components. 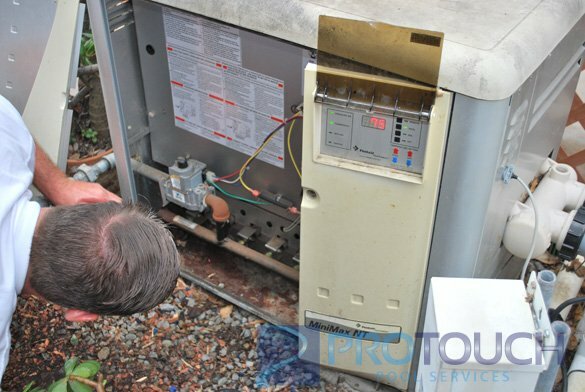 The pool heater repair diagnosis started with checking the transformer for power. The heater transformer was not working so we turned off the power at the breaker and installed a new transformer on the MiniMax NT. After replacing the heater transformer, the power was turned back on and the pool heater digital display lit up, allowing us to further troubleshoot the pool heater.